Need a last minute Valentine treat? My kids and I whipped these delicious, buttery cookies up on this snowy pre Valentine Sunday. 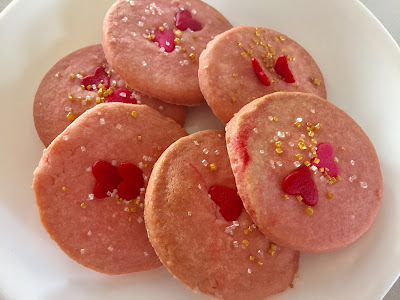 Apart from them sneaking pieces of dough and bits of sprinkles, these cookies are so simple to make with the little ones. Line 2 rimmed baking sheets with parchment. Mix flour and cornstarch. In the bowl of a mixer fitted with the paddle attachment, beat butter until fluffy, 3 to 5 minutes. Add sugar, and continue to beat about 2 minutes more. Beat in vanilla. Add flour mixture, and mix on low speed, scraping sides if necessary, until flour is just incorporated. Add food colouring until you reach the desired colour. Make two discs of dough and wrap each in plastic. Refrigerate until firm, at least 1/2 hour. Preheat oven to 325 degrees. Roll out 1 disk to about 1/4-inch thickness. Cut out shapes using desired cookie cutter , and transfer to prepared baking sheets. Reroll scraps. Repeat with remaining disk. Sprinkle sugar or sprinkles. Bake until firm and golden, 13 to 15 minutes. Let cool completely on a wire rack. Try not to eat them all in one go :-). We made these as treats for the girl's teachers. They are the perfect (nut free) snack for a play date or a simple treat. So fun and they are pink too! My girls love making things like this. 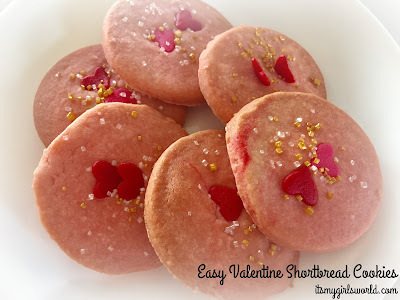 So pretty and perfect for Valentine's Day! I saw photos of the winter wonderland weather in Ontario this weekend so I'm sure this was one fun little project to keep the girls occupied indoors. These sound delicious and look so cute! These sound and look delicious. Thanks for sharing!